Enjoy your stay in our wonderful holiday house on our farm offering you all the amenities for a perfect holiday. The house sleeps 4-5 persons in cosy beds - one double bed and a bunk bed in the family room. Family Pretterhofer warmly welcomes you! St. Kathrein am Hauenstein, Styria Pircherhof - Urlaub und Erholung im "Troadkostn"! Enjoy your meals either in the parlor or, in summer, on the new and spacious terrace with wonderful view. Family holiday at its best. The parlor has a rustic table, a woodburner and a modern, completely furnished kitchen. The bathroom and separate WC are totally new. Internet access, satellite TV and central heating are only a few of the many amenities here. In front of the house a cosy garden with seating unit and BBQ facilities invite to long evenings outdoors. For kids we have a playground with swing and sandpit. 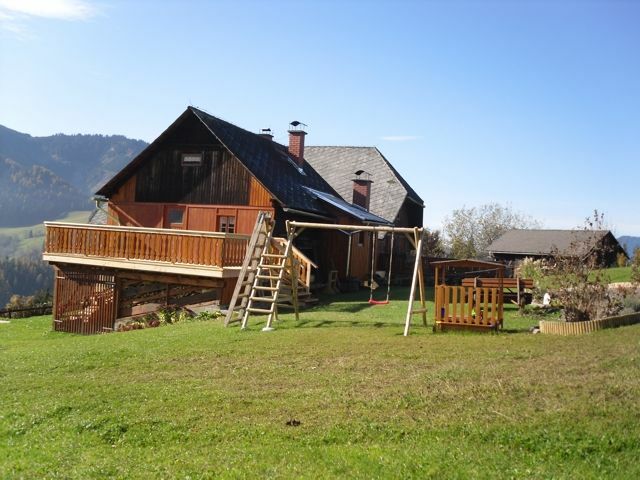 The farm lies near the Styrian long distance hiking trail to Mariazell and near the Teichalm and Sommeralm pastures. There are great opportunities for hiking and outing trips. Our guests enjoy life on our farm, the making of home-made products. Upon wish breakfast basket.